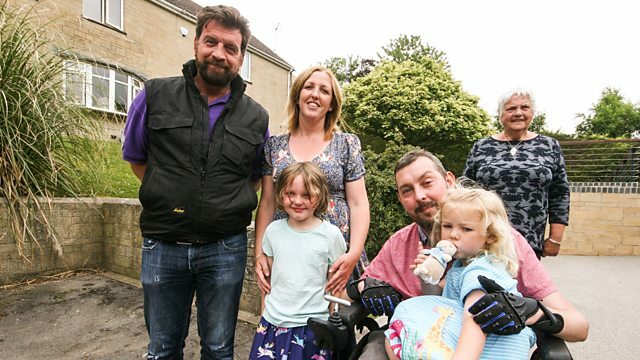 This week Nick Knowles's DIY SOS team pitch up in Avening in the Cotswolds to help project manager Ben, whose life was changed in a split second by a freak accident. This week, Nick Knowles's DIY SOS team, the flamboyant designer Laurence Llewelyn Bowen and volunteers pitch up in Avening, in the idyllic Cotswolds, to help project manager Ben, whose life was changed in a split second by a freak accident on holiday. In April 2016, whilst holidaying in Cyprus with his partner Ella and daughters Iris and Olivia, Ben slipped and fell head-first into the shallow end of a pool, breaking his neck in three places. After months of treatment in Cyprus and Germany, he was finally flown back to the UK, where the Salisbury Spinal Unit made amazing progress with him over the next 12 months. Despite his life-changing injuries there is hope: if Ben could return home, he would be reunited with his family and could even work from home again as a project manager. But for this dream to become a reality, his home needs to be adapted with front access and a two-storey extension with through-floor lift, along with everything for the bespoke care that Ben will need. Avening is a special place. The local community here have donated their time and money to carve out the steep stone hillside for one of the two extensions and lay a concrete ramp from the road to the front door, but funds have run out. Now the DIY SOS team are joining forces with this generous community to get the build finished.